Russian Foreign Ministry spokeswoman Maria Zakharova has called on the Western mainstream media to refrain from double standards in reporting on the Syrian conflict and cover the crimes committed by the US-backed groups in the country, while former US diplomat explains why the American people know nothing about such atrocities. Harakat Nour al-Din al-Zenki militans, considered to be “moderate opposition” by Washington, launched a toxic gas attack in the Syrian city of Aleppo on Tuesday killing seven people and injuring 23 more.The attack has been verified by the Russian Center for Syrian reconciliation which has also informed the American side of the assault. However the US mainstream media have not condescended to report the attack. Former US diplomat and GOP Senate policy adviser Jim Jatras explained why. “The American media don’t make it real clear the nature of the groups we’re supporting in Syria,” he said in an interview with RT. “We keep hearing about a moderate opposition instead of calling them what they are. These are radical Islamic jihadi terror groups – the same ones we keep saying we’re worried about launching attacks here in the United States,” he explained. “And here we are supporting groups in Syria that have this jihadist ideology, cut off heads of little kids, use chemical weapons and I don’t think the American people really make the connection because the media does not report it,” he noted. The former diplomat also added that the reason for the chemical attack is the development on the battlefield. The Syrian army is advancing in Aleppo cornering the rebels. However, he added, there is no “open-mindedness” there in Washington. Quite the contrary.“Remember the letter from the 51 diplomats at the State Department. And Hillary Clinton has indicated through her puppet Michele Flournoy, her designated secretary of defense, that if things are still going like this in January… they want to launch airstrikes against Assad. I don’t see an open mind here in Washington,” he said. Following the chemical attack on Aleppo, Russian Foreign Ministry spokeswoman Maria Zakharova has called on the Western mainstream media to refrain from double standards in reporting on the Syrian conflict and cover the crimes committed by the US-backed groups in the country. In her post on the Facebook page she also sharply criticized US behavior in Syria, accusing Washington of backing rebels who use poison gas against civilians and of killing hundreds in airstrikes. Zakharova called the rebels supported by Washington “animals,” and said Washington and its allies were recklessly carrying out air attacks leading to numerous civilian deaths. She noted that Harakat Nour al Din al-Zinki group has taken responsibility for that crime. It is the same group, which has been backed by the US and has been involved in the beheading of a young child in Aleppo after video footage circulated showing the boy being killed by a man whom activists identified as a member of the group. 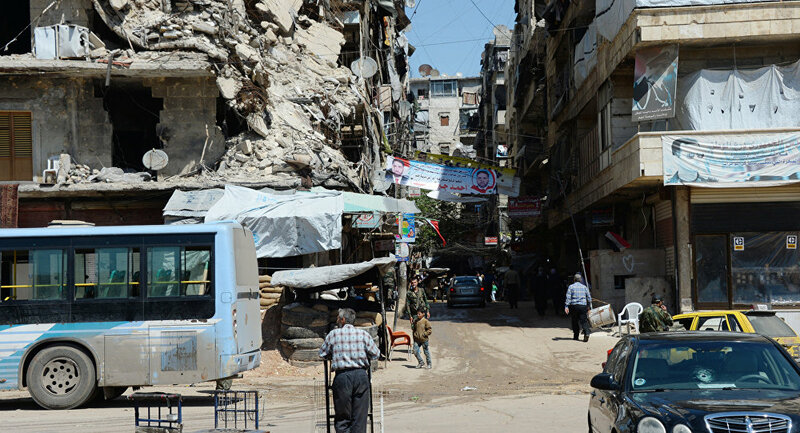 Terrorists have fired shells filled with a toxic gas in the Syrian city of Aleppo, killing five civilians, local popular defense forces told RIA Novosti. “Terrorists have used a weapon causing asphyxia and damaging the nervous system. Five people have died from suffocation,” a militia member said. Syria has been mired in civil war since 2011, with government forces loyal to President Bashar Assad fighting numerous opposition factions and extremist groups.Aleppo is partially controlled by Jabhat Fatah al Sham (previously known as the al-Nusra Front), an terrorist group outlawed in Russia and other countries along with Daesh.